For its fifth edition spread over 10 days, Mal au Pixel took over 5 galleries and various other spaces mostly located in the 11th arrondissement of North-East Paris. This year the festival continued exploring environmental issues, with a specific focus on initiatives from the South and on low-tech approaches. The programme featured several projects from Congo (Kinshasa), Senegal, Indonesia and India, finally brought after quite a struggle against visa and custom bureaucracy. Two projects realised in the context of Afropixel artist residencies in Dakar at Kër Thiossane were exhibited at gallery Benj. At the heart of both is electricity, and more specifically power cuts and failures, so frequent both in Senegal and the rest of Africa, due to the chaotic growth of urban infrastructures. The first project "7 soirées" by Shaina Anand and Ashok Sukumaran (India) was an experiment with supply and use of micro-electricity. It was built around the set up of a micro-radio, a micro-tv and a micro-cinema during 7 evenings on a local market in Dakar, in cooperation with merchants and other locals. The other installation "Simulen", is a very freshly produced piece by Jean Katambayi Mukendi (Congo-Kinshasa), self-taught artist and scientist, who has a passion for logic, maths and electricity. Simulen is an impressive machine whose shell is entirely made of paper and cardboard; it is a prototype for automatic correction of power distribution. If electricity systems have mostly become quite abstract in the North, in Africa it's something that people sort of manipulate with bare hands, putting a screw-driver here and there to correct failures in the diy style. This is of course extremely dangerous and repeatedly causes deaths of people and that is a phenomenon Simulen also wants to draw attention to. If it doesn't claim to solve the core of the problem that is political in the first place, it is the prototype of a tool that would be perhaps be the first one to make this electricity home bricolage more safe for people. At gallery Nuitdencre, next to a beautiful sound installation by Thomas Bégin (Canada), Yuri Suzuki (UK) brought his astonishing portable and colourful limited-edition vinyl casting atelier. 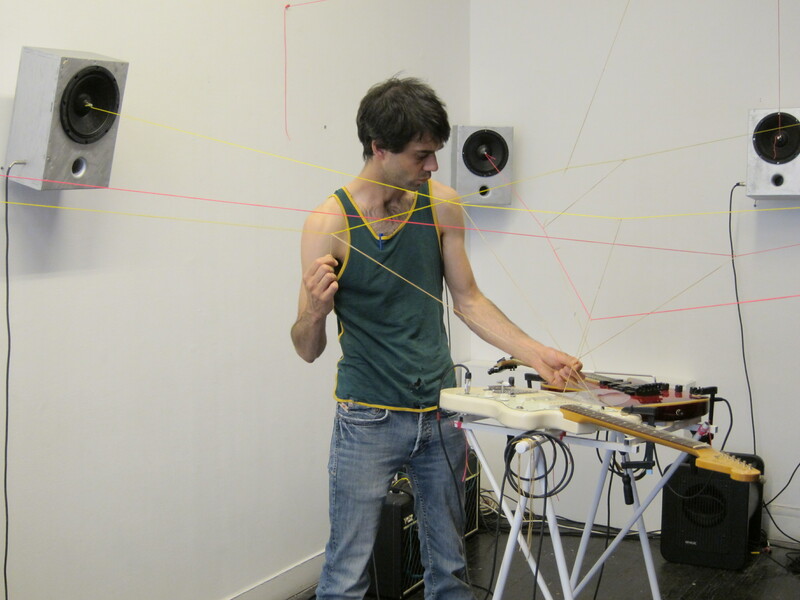 During the Mal au Pixel week anyone could come to the gallery with an instrument, a noise generator or recordings to get them burned onto a dubplate, to be then casted on red, blue or yellow recyclable plastic records. At gallery Mycroft, Andreas Siagian (Indonesia), presented his interactive sound installation "re-liquify 0.2" that uses water samples to reveal air quality, while next to it took place a workshop for refarming the city. These are just some of the projects that were presented, alongside with a day of Ykon's world simulation game and an extensive programme of experimental sound and audiovisual performances and concerts. The festival ended with a seminar that brought together an interesting mix of labs from the world, including for instance Crealab (Nantes, France), Craslab (St Ouen, France), Hackerspace & TMPlLab (Paris, France), HONF (Indonesia), Kër Thiossane, DakarLug, Trias Culture (Dakar, Senegal) etc. After a round of presentations, an interesting discussion took place around issues of the organisational and economical models of these labs and the challenge of remaining autonomous spaces while facing the pressure of becoming more formal. After an intense 4 hour, the bunch moved to the canal de l'Ourcq for a beer and released their last bits of energy into an international tournament of pétanque.